Blue. You can probably tell when you take a look at my artwork. Blue shows up again and again. Often times, if I’m working on a portrait and I’m not sure what color to use for a person’s shirt, I’ll just default to blue. 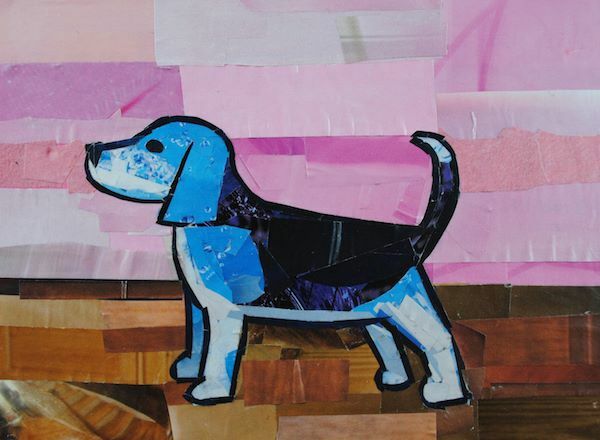 I’ve also created a series of animal collages where I used an arbitrary color scheme – making the animals blue. 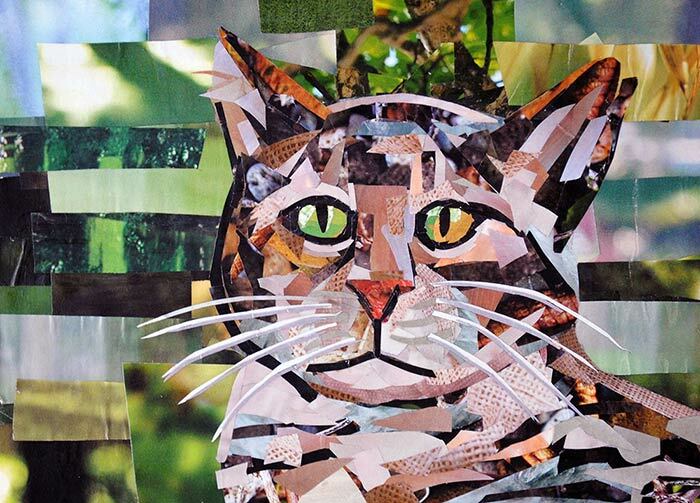 What other media do you like to use besides collage? 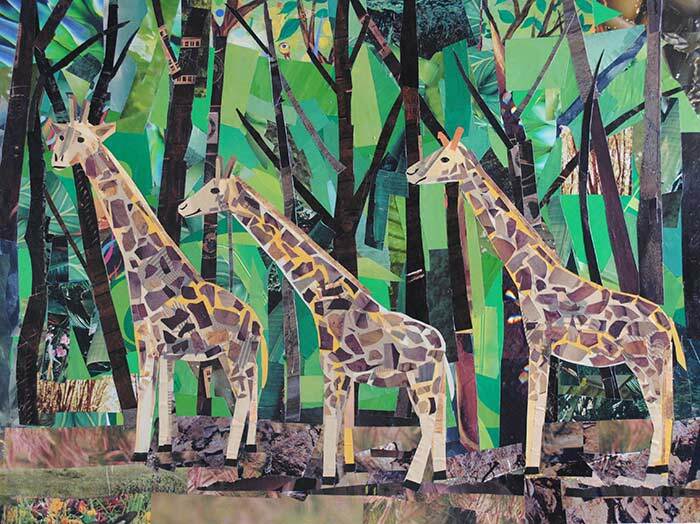 Collage is by far my favorite, although I’m interested in dabbling in film and animation. In the future, I may take some classes so I can get a better idea of the technical skills I’ll need in both areas. I used to enjoy painting, but over time I drifted away from it. 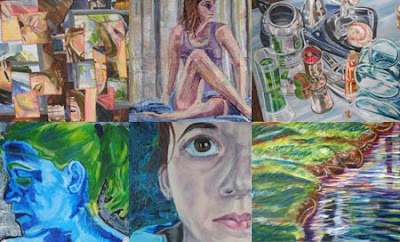 Below are a few of the paintings I did while in high school and college. Do you do anything else for a living besides being an artist? Yes – I work on the websites for a couple of nonprofits. After graduating from college in 2008, and in the midst of the recession, I realized I needed to teach myself a few skills that I didn’t gain from studying creative writing and painting in school. So I read several tutorials, watched how-to videos online, and taught myself the necessary software and coding for putting together websites. The design and problem-solving aspects of working on websites is why I like it so much. And the skills I’ve taught myself for non-studio-art-related-work have really helped me when it comes to promoting my art. Thanks to my studies, I was able to design the logo and layout for my website, and also be my own webmaster. Daydreaming and storytelling. Reading and learning about technology. Exploring new cities. Learning new things. Being an avid watcher of Netflix Instant Watch Movies. Living the creative life. What do you think is the most inspiring place to visit? Anywhere, really. If I’m in the mood or if I’m visiting someplace new for the first time, it’s amazing how inspired you can get just by looking at the scenery with a fresh pair of eyes. Q & A: What Motivates You? People who know me often comment on my work ethic. How do I manage to work on my artwork just about every day of the week, have a web-related day job, and have time for hobbies and, well, everything else? First and foremost I’d have to say that my love for the arts is what drives me. I also have a strong interest in learning new things and I’m constantly working on different ways of improving my work and myself. This passion for the arts is why I work so hard and why not getting very much sleep every night doesn’t really bother me. I’ve figured why not work really hard and do as much as I can while I’m young. I also have this mentality that I can’t wait for opportunities to magically appear for me – I need to put in the work to make them happen. Lastly, I must admit that the negativity that I’ve encountered in my life motivates me to prove those negative forces wrong. Rejection comes with the territory with being an artist, as well as hearing negative views from others about the arts. Instead of giving up when I hit a negative wall, I get momentarily irritated before getting over the irritation and moving on to work harder. And at the moment this has worked for me. I manage to turn these negative experiences into something positive for my art career. 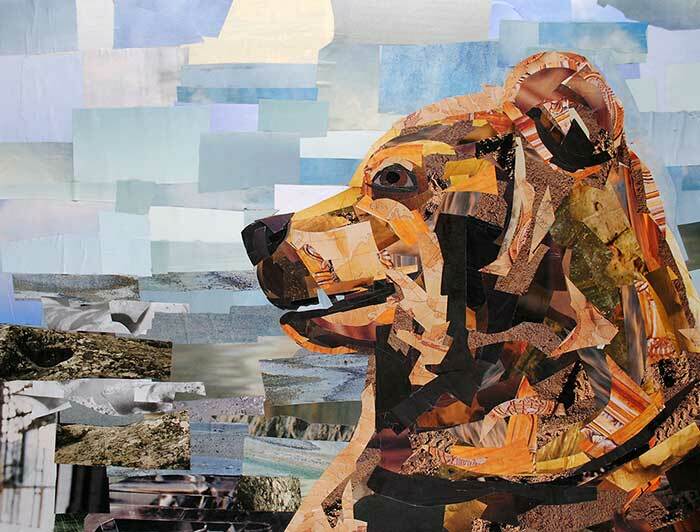 Tell me about your collage technique. 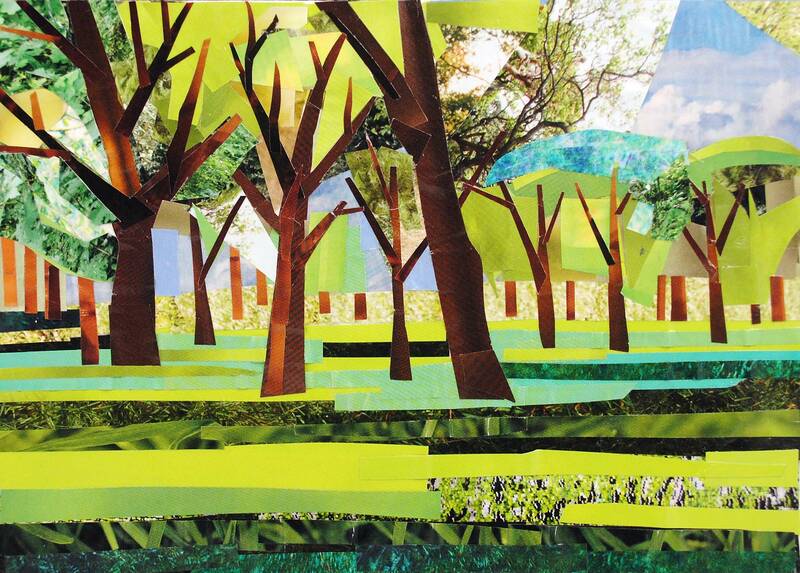 Each collage starts out as a sketch. This helps me get an idea of the proportions of the subject and get the likeness down properly. I’ve noticed that if I don’t do a good job with the sketch; chances are I’ll have a hard time getting the collage to look right. Next I work on cutting and pasting paper onto the sketched composition. I’ll page through a number of magazines, tearing out pages that have solid colors or textures that I may want to use. Then I start cutting out strips of paper based on the shapes of shadows and highlights that make up different areas of the background or subject. 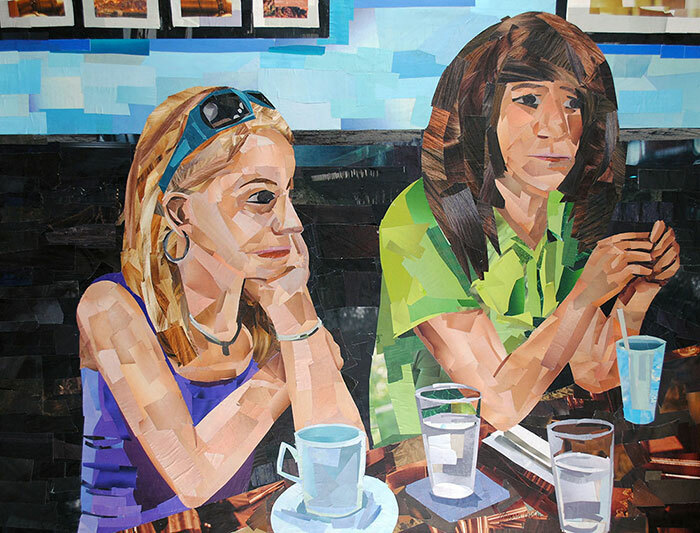 I’m able to recreate the look and feel of a painting by working with fragments and shapes of magazine strips – these pieces of paper act like the distinct brushstrokes in a painting. As I work, I think of areas where I could weave in fragments of photographs in order to create moments of interest and texture. How do you know when a collage is complete? Often times I don’t feel a collage is entirely complete. You just reach a point where you feel it’s time to stop. 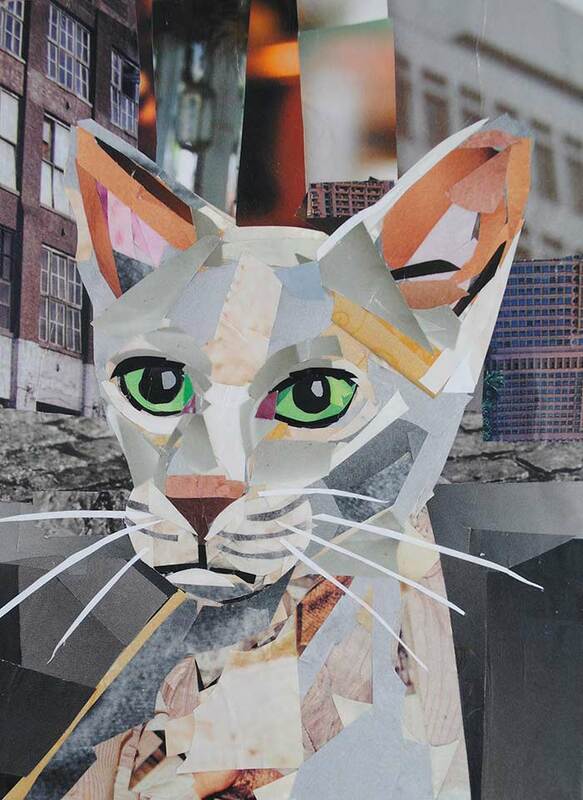 Other times I know a collage is complete when I’ve set it aside for a couple of days, returned to it and think that there’s nothing more I can do to improve it – it’s resolved, finished. What challenges have you found in your work? 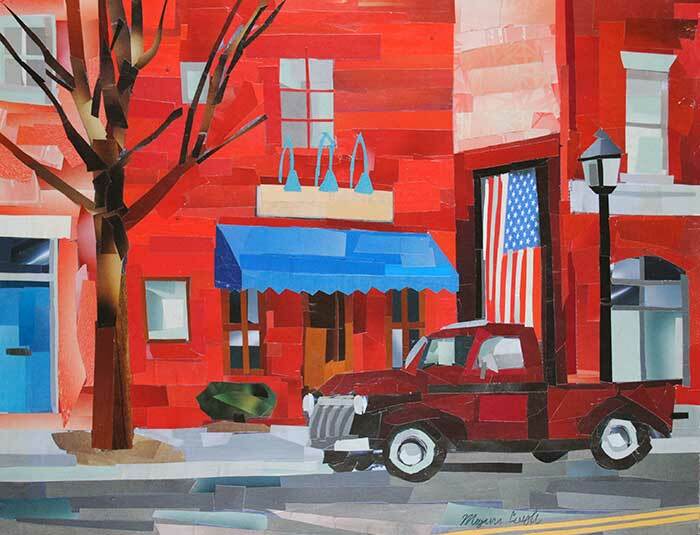 Since I work with colors and textures that are found in magazines, there’s always the challenge of finding the right colors that will work well with a given collage. Sometimes it will take a while of hunting through magazines – just feverishly turning pages until I find the right color or pattern that I can use in a piece. How has the Internet helped you promote your work? It has helped me a lot. If it wasn’t for the Internet, it would be more difficult for potential clients to contact me. Although having solo exhibitions and giving lectures helps a great deal with getting exposure, if it wasn’t for the Internet, people who have seen my work in exhibits wouldn’t have a way to find out more about me. The Internet has also made it a lot easier to sell artwork and prints, and allows others to contact me directly. My greatest ambition is to take my technique to new heights. For instance, I’d really like to incorporate video and animation with my work – I just need to give myself enough time so I’ll have a chance to dive in and work on it. I’m currently working on a dog portrait that I was commissioned to do – my client is going to give the portrait to his wife as a Christmas present. I recently completed another portrait that is also going to be given as a holiday gift. Aside from commission work, I’ve been working on editing the plot of my children’s book and sketching out illustrations that I will collage in the future. 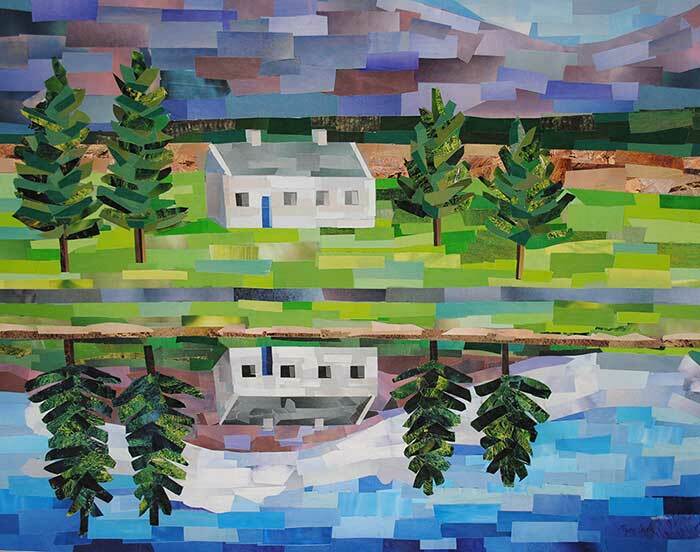 I’m trying to make my viewers question traditional ideas of what makes a painting a painting and a collage a collage by merging these two different mediums together. 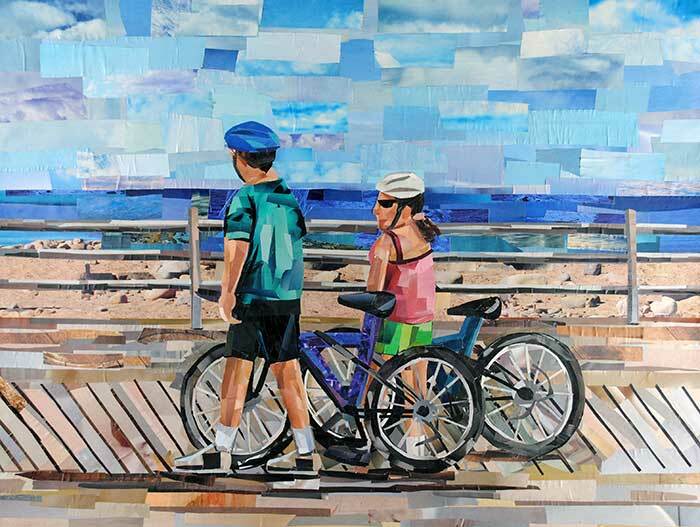 My collages are meant to be like an illusion – making viewers think they’re made from paint when they’re actually made from magazine strips. I like having my viewers question the materials of my work. 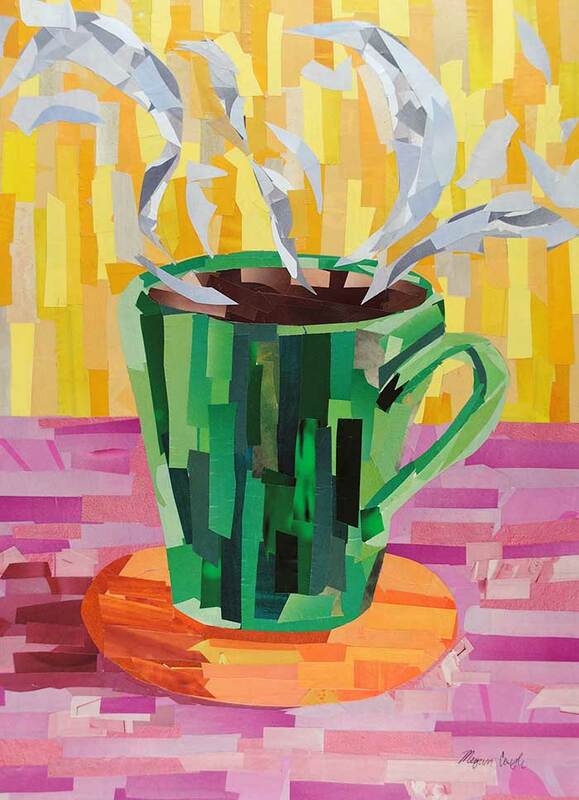 I like it when they mistake them as paintings, because once I tell them they’re made from magazines, they look at the work in a new light. 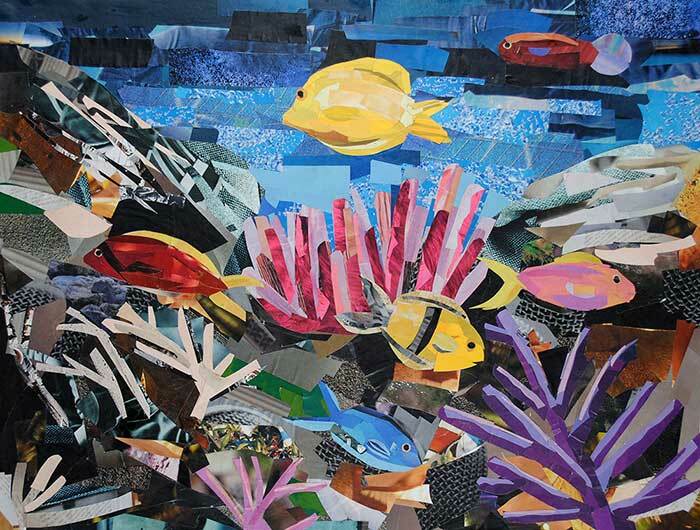 There’s also an urge to get closer to the collages to really study the handy work that went into creating them. I like this interaction of the viewer getting closer to take a better look. 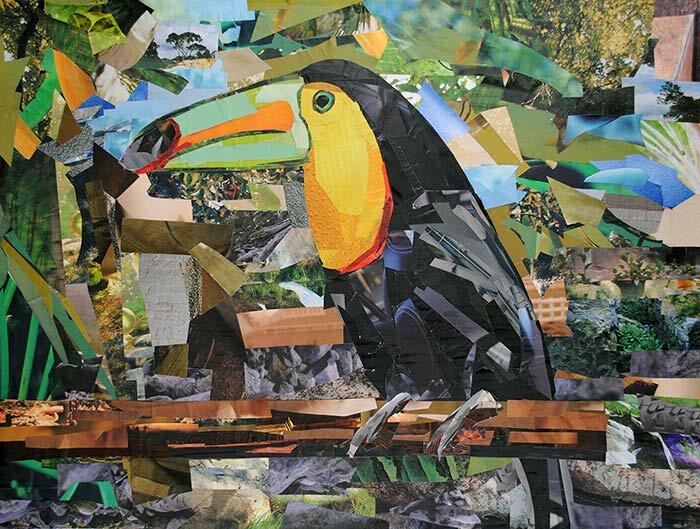 What is your favorite subject to collage? Portraits of people are by far my favorite subject to collage. I love all the details that make each person entirely unique and different than the next one. I also like how expressive the human face is as well as how people can tell us a story with their body movement and interaction with the environment around them. I’m really drawn to narrative scenes, and the human form works well with telling us a story. I also like making portraits of animals. Animals can be such characters as well – I love how colorful different species are. Animals also work well with creating narrative scenes, which are my absolute favorite type of scene to construct. How would you like to improve as an artist? 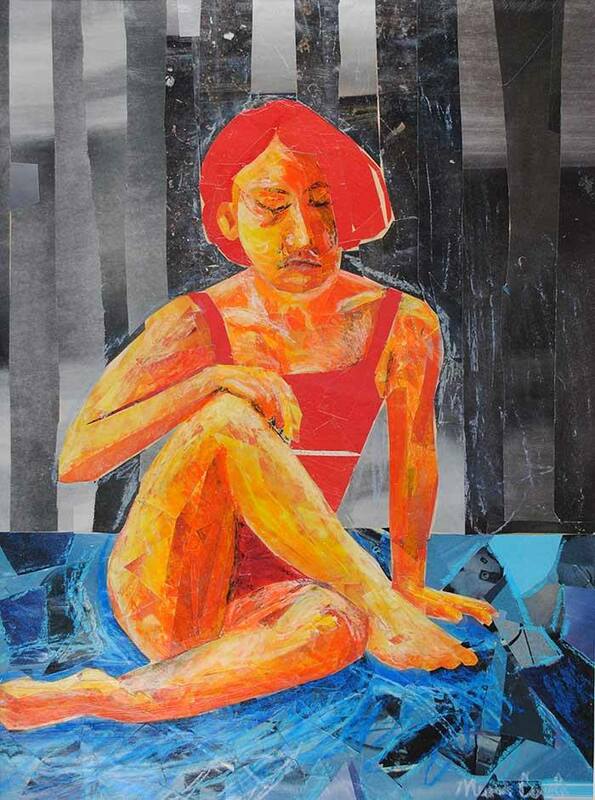 I would like to improve by finding more ways of presenting my work – by incorporating my technique and style with different mediums. I’m especially interested in getting better at working with animation. 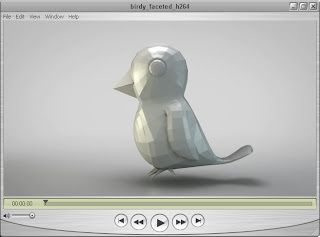 I have a feeling that animation would be a wonderful tool to use to create more dynamic artwork – artwork in motion. My work has evolved a lot before it became the body of work that it is today. 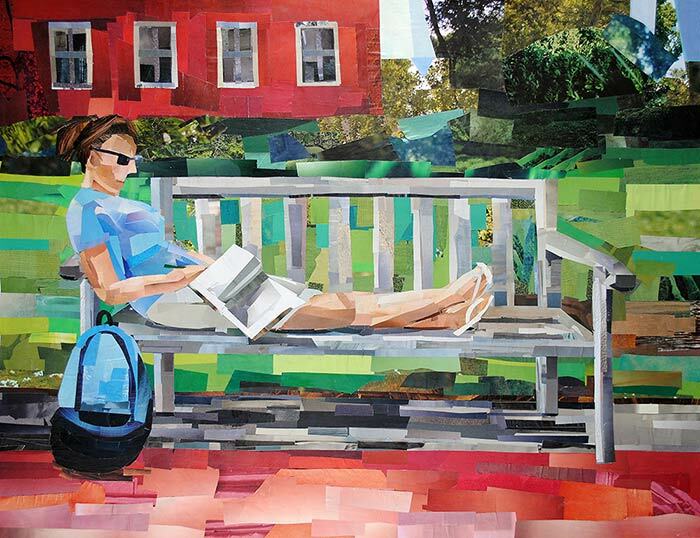 I started making figurative collages when I was in high school, although back then the pieces were much simpler—I didn’t use as many pieces of paper layered on top of one another. I also used a lot of oil pastels with my work—although I later decided the oil pastels were covering up some of the interesting patterns and textures from the magazine strips. In college, I studied Painting and Creative Writing, both of which have influenced the artwork for this show. With painting, I became familiar with great painters in art history and took a liking to impressionist and post-impressionist work. I liked working with distinct brushstrokes in my own work because I was more interested in shifts of color than blending colors. As a result, my technique translated well over to collage. With a background in writing, I’ve always had an interest in stories and storytelling. I wanted to make these scenes look like snapshots from everyday life—like the viewer could eavesdrop on the lives of a few strangers. 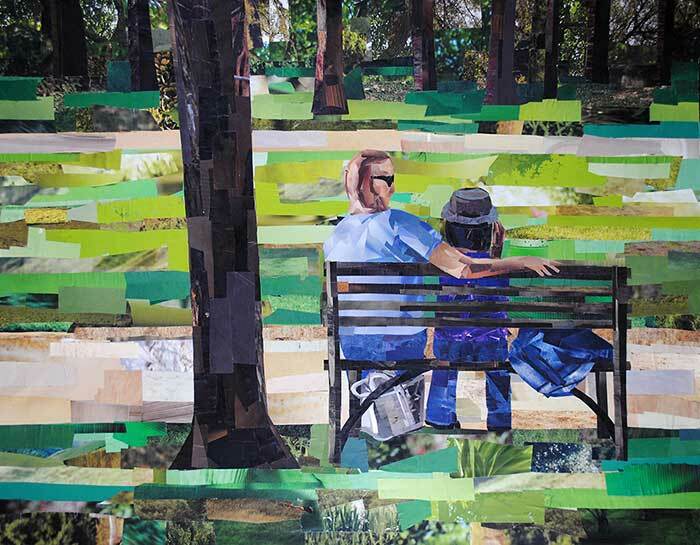 Also, by showing each scene as a snapshot, the viewers can have their own thoughts on what they think is going on in the collage—what the figures are doing, saying, or thinking. To give you a brief idea of what my process is like, for each work of art I got started by making a quick sketch. For some pieces, like up-close portrait pieces, the sketch was more detailed since I was concerned with capturing a likeness of the sitter. With collages that show the figure from afar, I had a tendency of making a quick sketch so I’d have an idea of the overall layout. 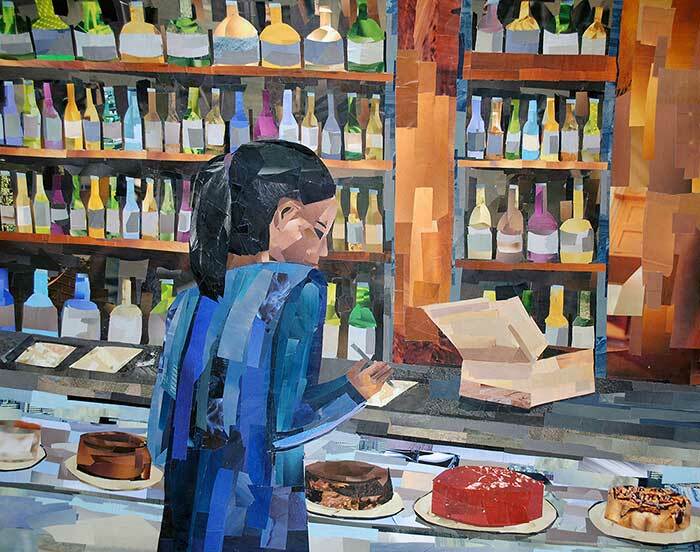 I use photographs as references for my work—mainly because the collage process can take so long that I wouldn’t be able to catch the immediacy of these scenes if I worked from life. Next, I page through magazines and tear out pages that have the colors and textures that I want to use for a particular piece. Then I typically begin with the background as I cut out shapes of paper and glue them down. Thus the background of the collage is pushed back and really is the background. By working strictly with magazines, I limit my palette to the colors, textures, and patterns I can find in magazines. 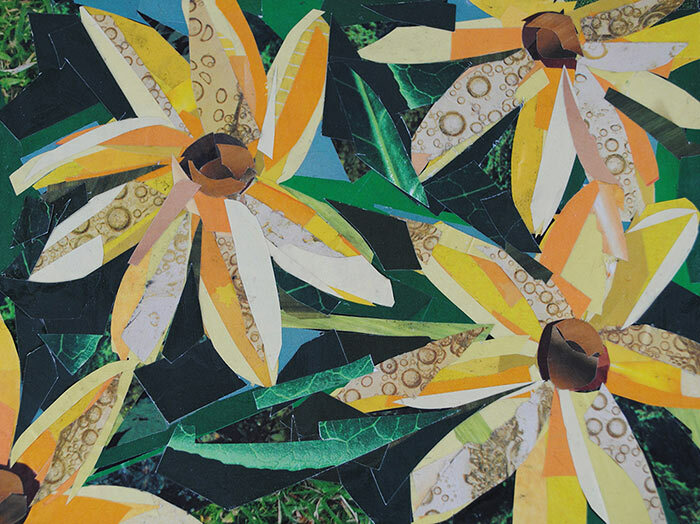 I like how flexible the medium is – I wait to varnish my collages until they’re complete, that way I can move around the pieces of paper, pulling up pieces in areas that are overworked. My collage work has been inspired by Chuck Close, a photo realist painter. 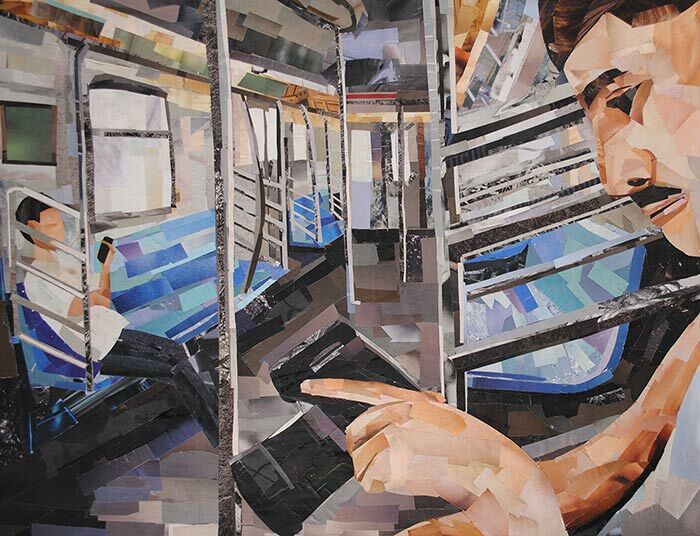 When you get up close to some of his work, you’ll noticed that he’s worked on a grid, using circles and squares of color that make the piece look like you’ve zoomed in to the pixels of a photograph. I like this concept of taking one medium and making it look like an entirely different medium. With Gerhard Richter, a German painter, I was really taken by a series of paintings he did that look like photographs—he painted a series in such a way that they featured the imperfections of photographs, the glares and blurriness that the medium can capture. I like the idea of having viewers question the medium I use. I also, in general, like the notion of taking something ordinary, like a magazine, and taking it out of its context by turning it into a work of art. The inspiration for this particular body of work came from looking back at my previous work and looking at the different directions I could go with it. 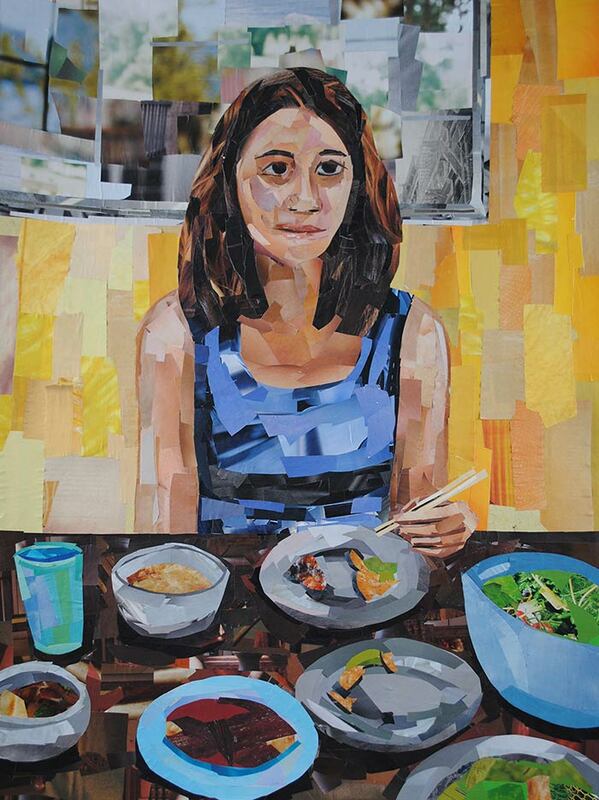 Previously, I had worked on a series of portraits that had similar compositions—just up-close views of the sitter. With this new body of work, I was really interested in working on showing different angles and narrative scenes. Instead of focusing in on depicting a likeness of the sitters from up-close, I wanted to experiment more with the figures interacting with the environment around them. In the future, I’d like to create a series that really captures my process. 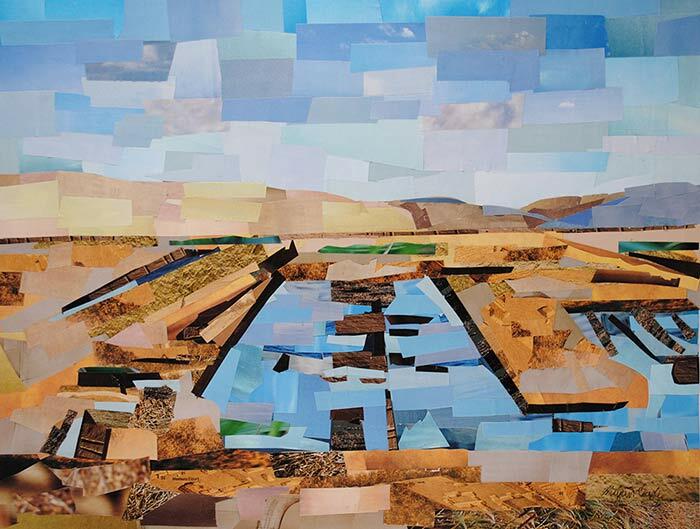 That would include having areas of the collage where the white of the paper shines through, sections of the under-drawing being revealed and overall the shapes of the magazine strips would be more isolated and noticeable. 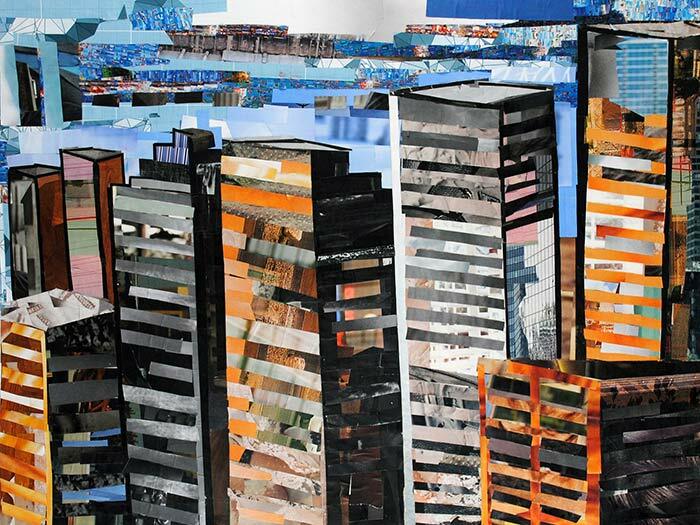 I’m also planning to work on a much larger scale and experiment with animating my collages. While growing up, if I wasn’t taking art classes at a local gallery, I took an art class at school. Art has existed in my life in one form or another, and I’ve grown to look at art as something that’s comfortable to me—it’s something familiar that’s been by my side for years. I also always loved the arts and when I was younger, I wanted to master drawing, dancing, music, and acting. Thus I attempted all those areas before realizing that visual art was something I didn’t get too discouraged with – I could keep at it. The other areas of art were another story. In preschool, I took ballet classes. I specifically remember having too much stage fright that I refused to dance at a recital the class held for all the parents. Eventually I danced for a couple of seconds when my mother bribed me with a Slurpee. The problem with dance was that it didn’t feel natural to me. I also didn’t like dancing in front of others, which automatically made me check off dance from my list of creative paths to pursue. For several years I played the piano. I also picked up the cello briefly in elementary school, but got tired of practicing two instruments. I was also pretty scrawny back then, and my cello probably looked a lot bigger than me. For some reason my peers thought the cello was just a thick block of wood and that I was ridiculously strong for my size. Although I played the piano for seven years, I eventually quit – I didn’t have that passion that drives a musician to learn, practice, and keep trying until she gets it right. What was next? How about acting? I took acting classes at a local theater when I was in high school. I enjoyed the whole experience – the bright stage lights, putting on stage makeup, the fun costumes, and memorizing my lines until I got them right. I had a blast with the whole production. The problem? I gave up too easily when I realized what I looked like on stage. One of the actors in my group invited us all over to his house after a play. His parents had taped every show he was in, and we watched previous plays we had been in together. I sat there horrified when I realized how terrible my acting was. I swore that I would never expose anyone to my acting again. Then there was writing. I wanted to be a writer for as long as I can remember. In elementary school, I carried around little notebooks that I wrote stories in. I was determined to write a complete novel by middle school. When that didn’t happen, I swore I’d finished my first novel in high school. I kept starting stories then getting tired of the direction they were headed in. I thought I was determined to become a writer, but then I decided to major in English with a concentration in Creative Writing in college. And now, since college, I haven’t written anything since my final Creative Writing class senior year. The writing workshops had sucked the joy of writing from me. It had been a painful experience of students tearing down every piece of writing that was workshopped. By the end of a workshop, I had no idea if I was doing anything right and felt like my writing wasn’t any good. The passion that was once there had faded significantly. Visual art hasn’t been easy either, but for some reason I never wrote it off as being impossible to do. Over the years, I’ve practiced my craft. When I’ve had difficulty drawing something, I’ve kept at it until I’m somewhat satisfied with the result. I can get incredibly discouraged with my art, but I’ve never given up on it completely. I think that’s because I can’t imagine what life would be like if I didn’t make art – that’s not an option for me, “not to make art.” I simply make it, have to make it. It’s something that’s been ingrained in my mind and daily routine. I’ve chosen art because it’s something I need in my life. It’s hard to explain to non-artists out there, but I know you can understand if you’re passionate about something in particular. If you love to read, or write, or watch movies, and you simply can’t get rid of any of those things from your life, then that is precisely what art is like for me. I can’t imagine ever giving it up. I’ve done it for years, I’ve grown up with it, and I’m terribly curious to see what direction it will take me in next. This American Life – I really enjoy the way this show focuses on a theme and tells stories related to that theme. The old English major within me really gets a kick out of this. The Classic Tales Podcast – again, I like to read but lately all my artwork and marketing work has really made it difficult to pick up a book. With this podcast, I can enjoy familiar stories or hear classic tales that I’ve never heard before. Fresh Air – I’m a sucker for Terry Gross’s interviews with directors, musicians, and actors. It’s also a good way to hear interesting stories about current events. 60 Minutes – just good journalism. Escape from Illustration Island – when I first discovered this podcast, I downloaded all of the episodes and gradually worked my way through them. Needless to say, listening to Thomas James interview illustrators and talk about illustration is part of the reason I decided to look into going back to school for illustration. You can find some really helpful and inspiring tips here if you’re a fellow artist. Art Marketing Action Podcast – these are typically really short podcasts, only a couple of minutes, and from time to time I get a few good ideas of directions to move in with my art marketing. 500 Days of Summer Soundtrack – this is my latest obsession. For some reason I absolutely love this album and just about every song on it. “You Make my Dreams” by Hall & Oates is of course a favorite. When I get tired of listening to interviews and music, I’ll usually change things up by watching a movie. I’ve started taking advantage of Netflix’s Watch Instantly feature. I’ll listen to/watch movies on my computer as I sprawl out on the floor with all of my magazines. Lately I’ve watched a lot of comedies and flicks from the 80’s. What do you like listening to while you work? I’ve gotten this question a few times over the past few months, so I thought I’d go ahead and share it with you. I prefer taking pictures of my artwork myself. That way, if I notice something’s amiss when I zoom in to study a high resolution image of my work, I can easily retake the pictures in the comfort of my apartment. I have to admit though—I slack a little bit when it comes to taking my progress pictures (sometimes I just don’t set up the lighting). I used to use a Canon PowerShot SD600 and I’d go outside on an overcast day to take pictures of my work. You’re probably already predicting where things went wrong with this method. Since I was relying on the great outdoors, the lighting was inconsistent and unreliable. I had to wait for good weather before I could go outside for the photo shoot—that means waiting for the rain and snow to go away. 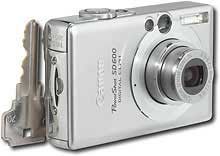 And the PowerShot camera is just a simple point and shoot camera so the quality of the images isn’t that great. I noticed that a lot of my artwork often looked washed out and sometimes blurry—something that I only noticed once I lugged all my artwork back inside and uploaded the images to my computer. 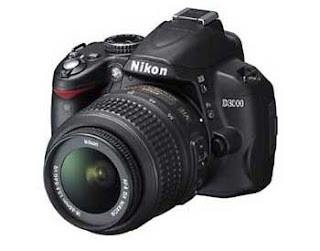 Now I use a good old Nikon D3000 and I love it. The image resolution is much better and I have more control over the settings. I also use a light kit that I got from B&H. It’s a Lowel Ego Digital Imaging Fluorescent light kit that came with stands and tilt brackets. With the light kit, I can control the lighting. And best of all, I don’t have to rely on the weather outside to take pictures of my work. I’ve been making art all my life, but I started taking it more seriously about four years ago. I took art classes as a kid at a nearby gallery—dabbling in pottery, sculpture, cartooning, painting—the works. During the summer, I’d create my own paper dolls and illustrate stories. And I always had an art class at school every year. I considered these classes a nice getaway, a way to relax and unwind. 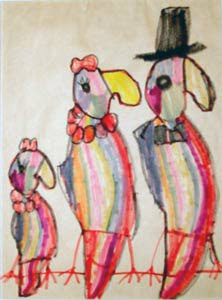 Drawing by Megan Coyle at age six. How do you get inspiration for your artwork? I find inspiration from common, everyday things—the bright colors of a farmer’s market, someone making a funny face, animals lounging at the zoo. The world around us is filled with so much color and excitement. 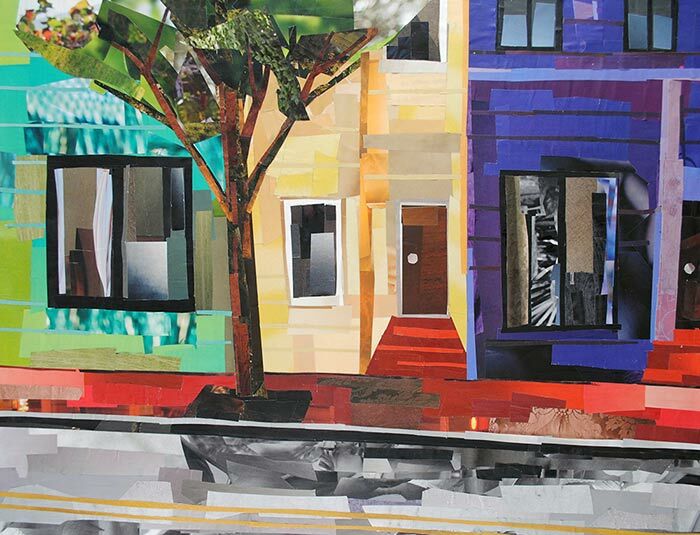 For several years here and there, I’m sure I made collages the way most people did as a child—by collaging words and photographs to create a jumbled mix of recognizable objects. 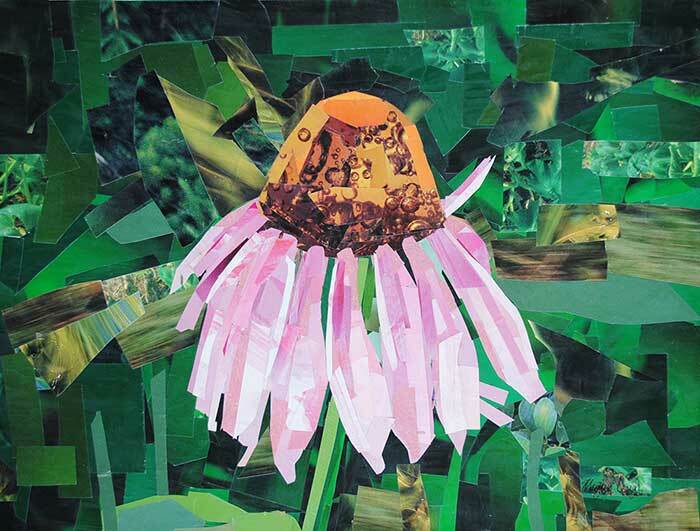 In high school, I explored a variety of media, including collage, and over the years, my technique evolved. 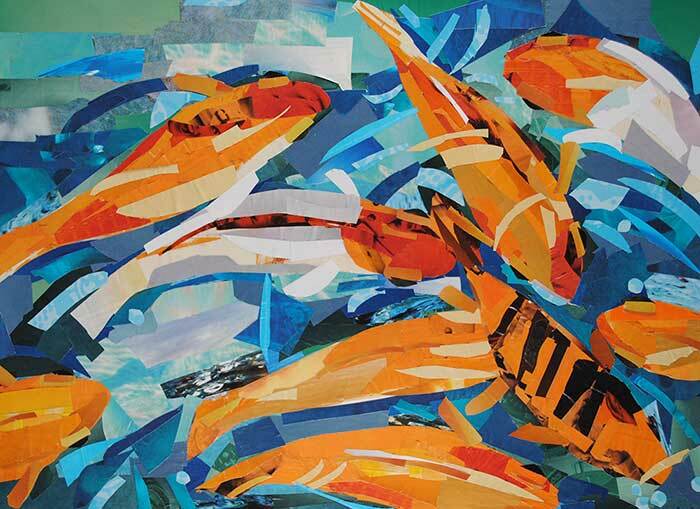 During my senior year of high school, I started making collages the way I currently do—cutting out shapes of color and texture from magazine pages to construct figures. 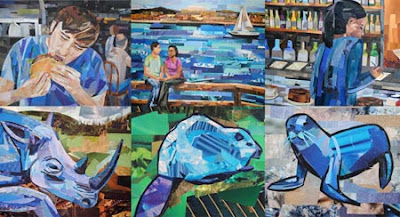 However, I focused more on playing with color and I’d draw over my collages with oil pastel. I typically work on artwork a couple of hours a day every day. I aim for longer than this, but the time I set aside for art fluctuates depending on how much time I need to devote to my web and graphic design work. When I need to recharge, I usually take a break from work in general. Getting away on a short vacation can help me recharge my batteries. Taking a simple trip to a museum or wandering around town to take pictures can do wonders to my creativity. For my first job out of college, I worked at a local art museum as a security guard (believe it or not). The museum only hired art majors or historians for the position, which is pretty odd because I don’t consider artists to be very intimidating people. And I think the general public agreed with this. The hours were long and grueling, and I ended up quitting after a few months because it wasn’t challenging enough. That and I’d rather make art than bark at people to get away from it. Working away on collages while putting on a solo show about once a year. I also see myself working more with animating my collages. And I hope to crank out a couple of children’s books by then. I’ll definitely live and breathe art no matter what I’m doing. Getting accepted for my first solo exhibition was incredibly exciting. 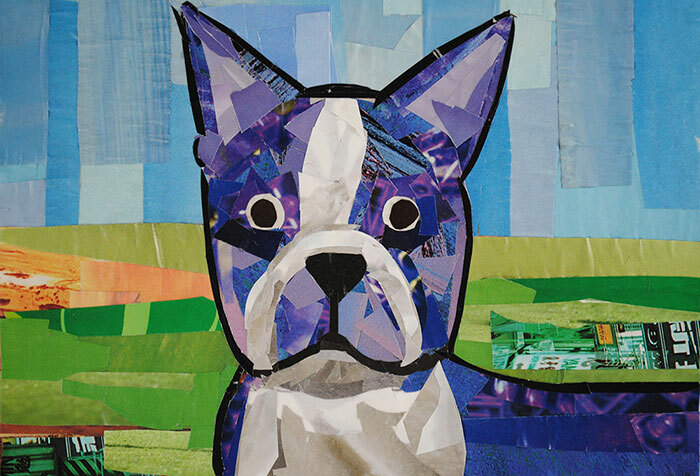 I’m also ecstatic every time I hear from teachers who have used my artwork as examples in their lesson plans. It’s just really rewarding knowing that your art is being used to teach and inspire. Help others realize how great art is. One of my life-long goals is to make people think of art the way they think of rock n’ roll. What other interests do you have outside of visual art? I’m a junkie for every art form out there. There’s nothing I love more than seeing a great concert, reading a good book, or watching a movie that makes me think more about the world around me. Whenever I’m blessed with the kindness of a fellow artist or art enthusiast—nothing else makes me believe that art is bound for bigger and better things.